A 573-pound bluefin tuna caught on June 24th by Frederick "Bo" Haycox of Virginia Beach has been certified as a new Virginia state record by the Virginia Marine Resources Commission. This topped the prior state record by almost 200 pounds. Haycox caught his fish, which measured 107 inches in length with a girth of 70 inches, in the offshore waters of the Virginia coast. He was fishing with his father, Ricky Haycox, on his private boat Episode with Captain John Savage. Captain Savage confirmed they were trolling for billfish with ballyhoo when simultaneous strikes produced hook-ups for two giant tuna. Bo Haycox grabbed the larger offshore trolling rod, an 80-pound class outfit, and started fighting his recordsetting tuna. The captain and crew quickly realized two giant tuna could not be fought at the same time, so the fish hooked on the smaller, 50-pound class outfit, was broken off. Haycox battled his tuna for almost four hours, through blistering runs that nearly took all the line off the reel, before boating the tuna. The prior state record of 398-lbs., 8-ozs. was caught at the Fingers by E. K. Morrison of Nags Head, NC on November 11, 2003. 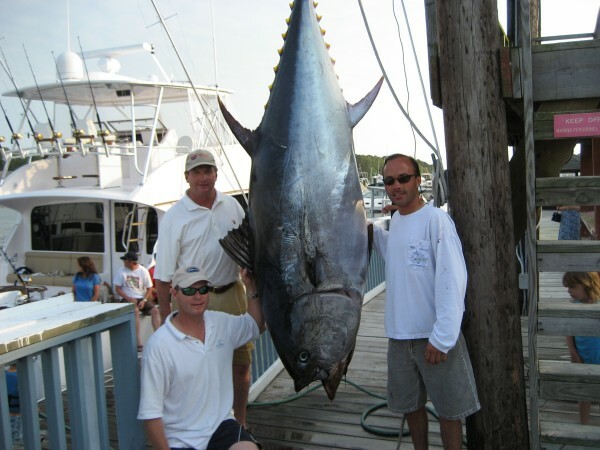 Click here for a picture of the new State Record Bluefin Tuna.